You can forgive Jaguar for the rather elaborate name. What we used to call an estate is now rather more grand thanks to the Sportbrake label. 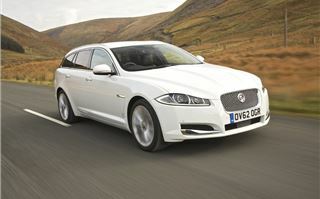 But then this is more than simply an estate version of the XF. 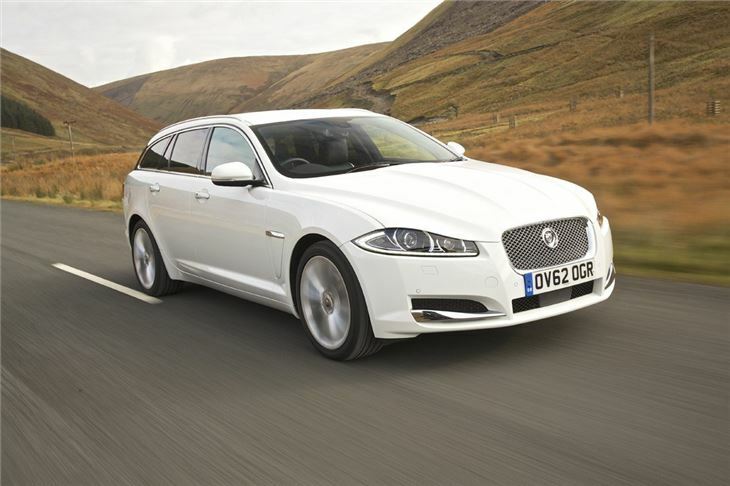 The Sportbrake is a key model for Jaguar as it looks to widen its appeal - it's a car that has plenty of impressive alternatives out there, the BMW 5 Series Touring to name just one. It's certainly a good looking car with a low and aerodynamic shape while the rear itself is one of the neatest estates around. 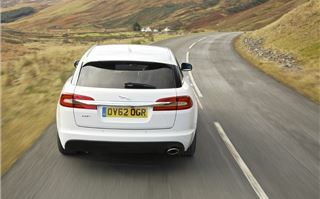 It has a great stance and is more than simply an XF saloon with an extra bit grafted on the back. In fact you could argue that it's better looking than the saloon. 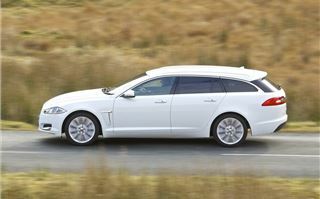 The new XF look, introduced when the model was facelifted early last year, means the Sportbrake has plenty of road presence too. Inside the it shares the same high quality and boutique-inspired interior with plenty of intriguing touches like the metal gear selector dial that rises out of the dash and the air vents that rotate open when you start the car. Even that has a touch of class with a start button that pulses red like a heartbeat. It's one of our favourite interiors with a simple yet elegant design and easy to use controls. Crucually it doesn't try and copy rivals like Audi and BMW, instead the Jaguar has a sense of British-ness that's a refreshing change. That's not to say it's old fashioned though. Of course you can get the traditional wood veneers finishes but there are also aluminium and piano black trims. The central touchscreen controls the main functions including the navigation, radio and climate. It's not the best system around, but is at least easy to use and clearly laid out. 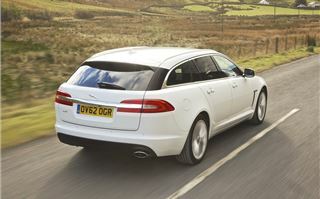 While the XF Sportbrake may look sleek, this isn't style over substance. 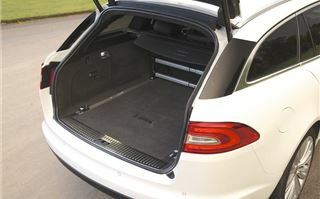 It has a usefully large boot with 550 litres of space and although this is a few litres less than rivals like the BMW 5 Series Touring, the wide boot area has been designed to be user-friendly with vertical sides and no load lip. 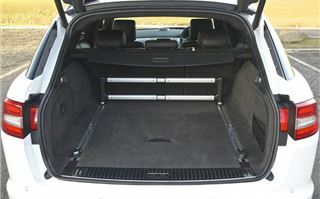 There is also a useful floor rail system, similar to Audi's set-up, that's available with adjustable straps and bars. Jaguar is keen to point out that you can get a set of golf clubs in sideways. 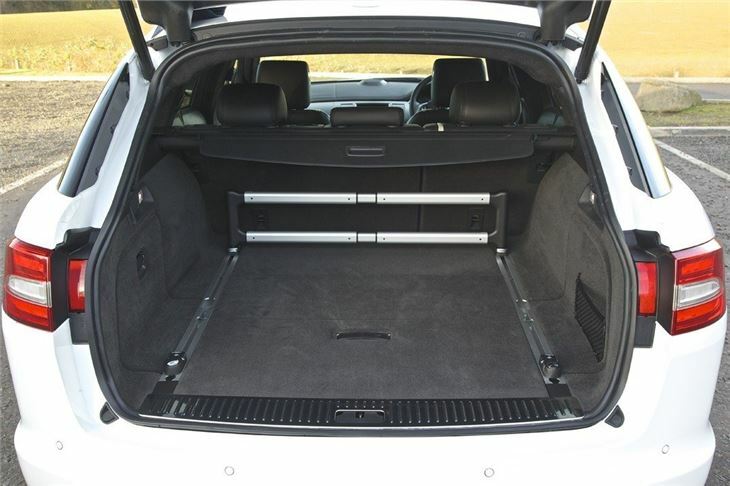 The rear seats can be folded down via levers in the boot, so you don't have to lean in through the side doors, plus once down they create a level load area almost two metres long. The tailgate opening is wide too, so it's genuinely possible to actually use that space for boxy or large items such as furniture or fridges. 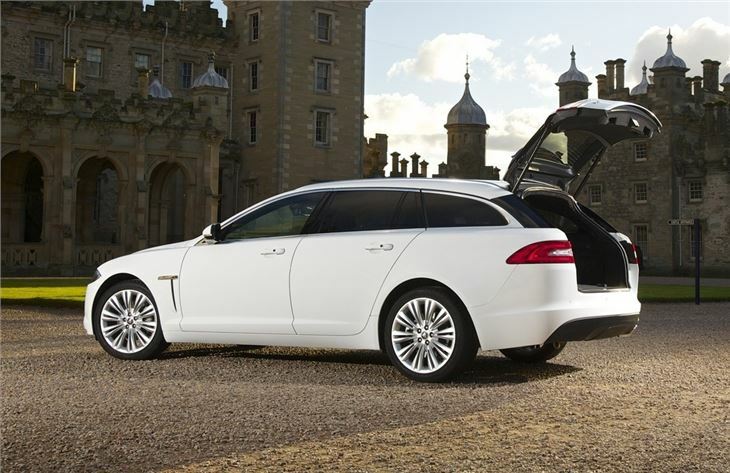 Although it's unlikely someone who bought an XF Sportbrake would be picking up white goods from Curry's or a sideboard they'd bought on eBay. One neat touch is the soft close tailgate, so you don't need to slam it shut. Plus there's the option of electric opening and closing. 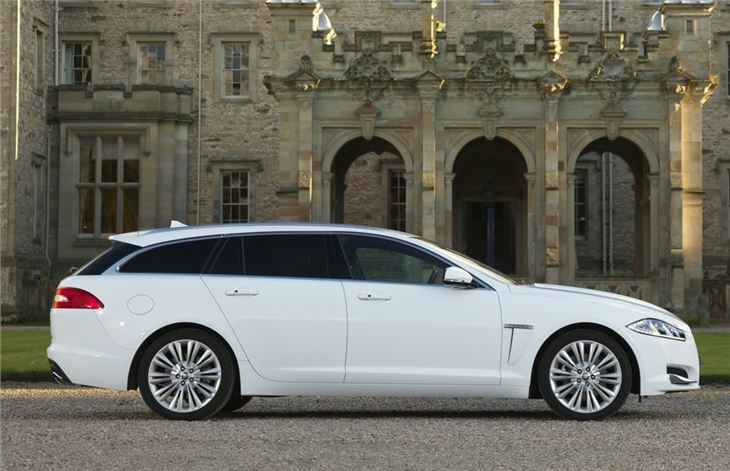 Elsewhere, those sat in the back get more headroom than in the XF saloon thanks to a higher roofline. 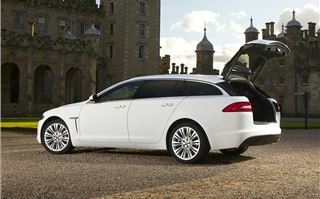 There are no petrols in the XF Sportbrake range and at the moment no XFR version although that's likely to change. For now we get four different diesel models based on two engines. The entry-level model is powered by a 2.2-litre diesel that was added to the XF when it was facelifted last year and is shared with the Land Rover Freelander. There are two versions of the 2.2D with a base 163PS model which is aimed primarily at company car drivers thanks to its lower list price - the SE version comes in at less than £32k. The more powerful version has been tweaked so now has 200PS (up from 190PS when it was first introduced in the XF) and with 450Nm of torque looks ideal on paper. The 55.4mpg economy is another big appeal while emissions of 135g/km are impressively low for a car this size. However the engine isn't particularly impressive and lacks the pulling power you'd expect given the torque available. It's fine for pottering about in and indeed acceleration in a straight line seems pretty good, but it's the combination of the four-cylinder diesel and standard eight-speed automatic which doesn't quite work. While the gearbox is well suited to the larger engines in the Jaguar range, it doesn't get the best from the smaller 2.2-litre diesel and seems to constantly hunting for the right gear. As a result the engine spends a lot of time at high revs where it's intrusively noisy - hardly in keeping with Jaguar's refined image. It often kicks down when you'd expect it to just pull from low revs which makes progress far from smooth. 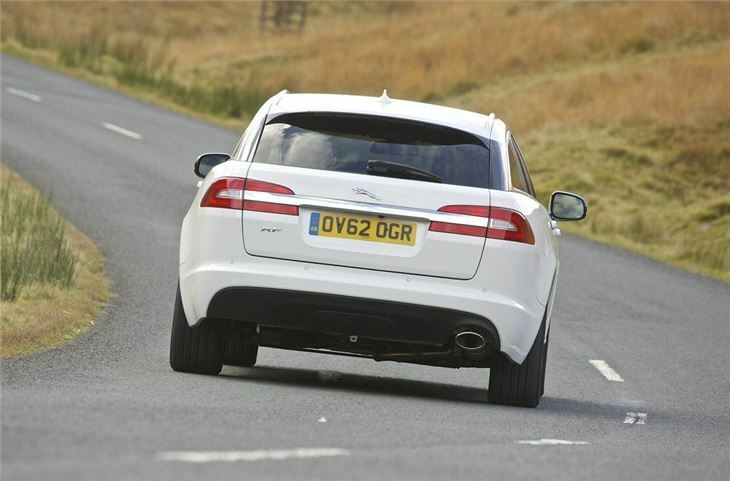 The 3.0-litre V6 diesel is the model to go for if you want performance. There are two versions - the standard 240PS model and the 3.0 D S with 275PS. It's the perfect engine for the XF Sportbrake with effortless acceleration and huge reserves of pulling power. It even manages to sounds good. It's genuinely quick too with the S managing 0-62mph in just 6.6 seconds. Official economy is 46.3mpg for both models although you'll probably see late 30s in reality. 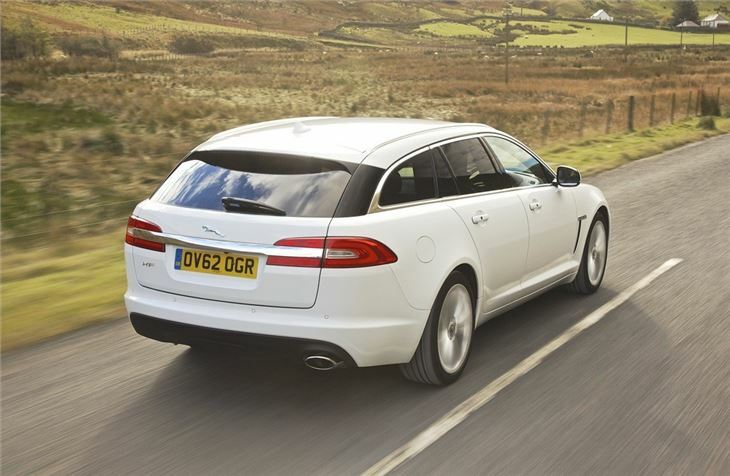 All XF Sportbrake models come with self-levelling rear air suspension instead of the coil springs of the saloon and as a result the car is always level even if it's fully laden or towing a trailer. It feels as good as the standard XF when it comes to handling. It's as confident in corners and equally as agile, although like the XF saloon, the ride is fairly firm and not as smooth as you'd expect. That said overall refinement is mightily impressive and at motorway speeds there's very little wind or road noise. Launching an estate version of the XF is an obvious move for Jaguar given the popularity of cars like the Audi A6 Avant and Mercedes E-Class Estate. 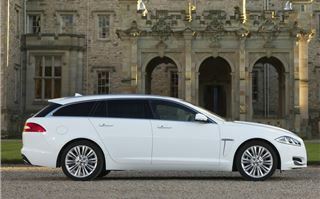 The brand has managed to create a sleek and stylish estate that's still practical and good to drive. The only let down is the 2.2-litre diesel engine which doesn't quite deliver what it promises on paper. 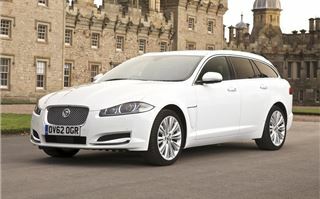 Compared to a BMW 520d Touring it's disappointing. But that shouldn't detract from the rest of the Sportbrake which shows great attention to detail. 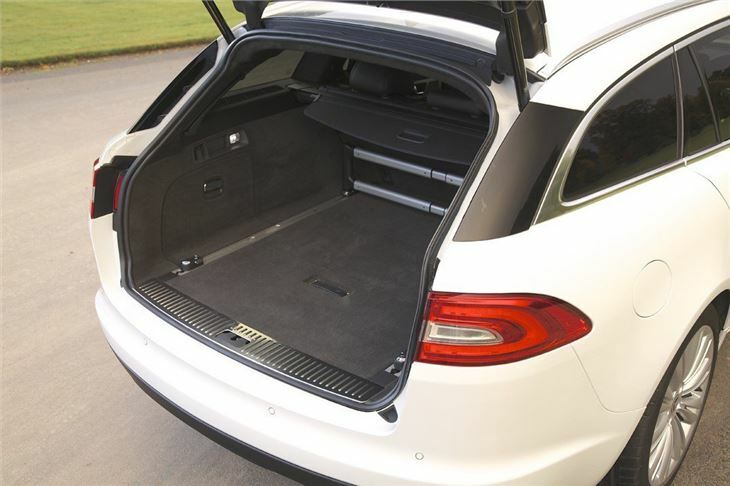 The beautifully finished interior and impressive refinement are the stand out elements of what is a hugely desirable estate, but it's the user-friendly and versatile boot that will be the big appeal for most potential owners.